In north western BC Canada lies a great river the “Stikine”.The Stikine one of B.Cs. major river and has the drainage area about the size of Switzerland. It drains the mountain highland where several other rivers start. The Stikine, Skeena, Nass, Taku rivers drain to the west. Draining to the arctic the Dease and Turnagain rivers part to the north. Firesteel river in the south west of the Stikine headwaters parts into the Finlay and Peace river and eventually finds its way to the arctic. Flowing as small clear, fresh trickling streams from the highlands of the northern limit of the bowser basin of the interior, the Stikine starts it’s descent from, willow and arctic birch, then through broad forested valleys of spruce, pine, poplar and willow. After it has picked up a number of tributaries, halfway on its journey to the sea, it suddenly picks up an aggressive pace at Entry falls, and drops to an average of forty feet per mile. Through the centuries the river, has carved a canyon eight hundred feet deep. Through out the canyons history it has been a lake bed, under glaciation, and also filled with lava which flowed from mount Edziza eruption. The mighty river did not stop there as it carved through anything put in its way and still grinds the canyon away. Once released by the canyon’s narrowing grip the river takes on a wider slower pace to the ocean. It cuts through the coast mountains and rain forests of spruce, hemlock and balsam, taking on additional rivers like the Iskut river. At one time the Great glacier pushed it’s way in to the Stikine river, but in recent times it has receded. Finally the Stikine’s furry is calmed by the tidal waters near Wrangle Alaska. The drainage area of the Stikine is still quite undeveloped by man and some of the only huge wilderness area left in BC. A wilderness where eco systems are still in tack. The upper end of the Stikine river cuts through a vast plateau which once was under the sea. This rolling plateau which is good wildlife habitat, excellent for moose and caribou, bear, wolf, goat, and sheep. Most of the upper end is in the Spatsizi Park where guide out fitter works several bases with in it. The original establishment of Hyland post was started by the Hyland brothers, and later Coldfish lake and Hyland were run by Tommy walker, who start big game guiding with the help of native families from the local area which living there year round. Now there are other bases at Bug lake and Laslui lake. Coldfish lake is now run by BC Parks. Glady’s lake ecology reserve was first created after Val Ghiest did his sheep study in the 60’s and was set aside for the study Stone sheep. It is the only area not hunted. The abandoned BC rail road that was destined for Dease lake which parallels Spatsizi park now is an access point for for park visitors and canoeist. Recently local natives and industrial developers of the resources, have had there disputes over the land. Coal and methane gas are being explored in the Klappan area reaching as far down as the Skeena and Nass rivers. An area known as the Klabona. Three small villages are located in the Stikine drainage, Iskut, Dease Lake, and Telegraph creek. Iskut on highway 37 to the south of Stikine, originally was home to a few native families that lived there. Later additional people moving from Caribou Hide, Metsantan and Bear lake area. Now it is a Native village of three hundred people. Dease lake north of the Stikine is located on highway 37 at the junction of Telegraph creek road. Few old buildings turned into a settlement, which increased as a government services developed. Further to the west along the Telegraph creek road one of the older towns is Telegraph creek which was a major access point for the Telegraph trail. During the second world war some equipment was brought up the from Telegraph creek to Dease lake and barged down the Dease river to the Laird River. Telegraph Creek village still stands on the west side of the Stikine canyon. Talhtan village at the junction of Stikine and Talhtan rivers was a major place for the Talhtan native people. One main Highway 37 crosses the Stikine and continues to the Yukon. Most other travel has been by water. Stikine being a big powerful water, spanns many miles in to wilderness areas, and in many cases only reachable by water navigation. Over the years the river travel has been one of the few ways of travel. River boats have been used to haul people and supplies. 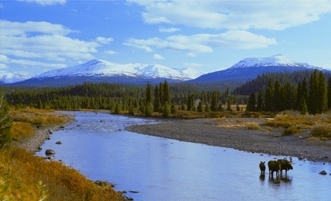 Whether it is travel up from Wrangle Alaska or hunters which flood the river every september in search of the rare moose. River boats have been used to haul and build camps up along the Stikine river. They have hauled fuel and food supplies for those working in the bush. In early days boats have been used for the building of the Telegraph line. Even larger sternwheelers have brought equipment to Telegraph creek for mining and road building. It does not end there as every year canoeist and boaters flock in numbers to view the vast wilderness. One of the First stepping stones for launching into the wilderness is Tatogga lodge and with a North Pacific seaplane base also located there. At times helicopters are also based out of Tatogga supplying access for travelers and exploration companies. Food, gas, lodging has been the focal point here for the weary traveler. From here most of the trips have headed up or down river. From Tatogga lake trips have embedded in to most of the Stikine watershed, mostly to Spatsizi and Edziza parks. Another seaplane base is located at Dease Lake , BC Yukon Air service which also service the wilderness out of Dease lake. From time to time Telegraph Creek also has a floatplane for the wilderness. Wilds of the Stikine has been is the past has been serviced with horse pack trains and bush planes which, carried supplies which could be delivered by no other means. Previously these trails were traveled on foot by the Talhtan people. Mostly timbered with wet boggy ground makes foot travel hard over vast distances. Now still bush planes and pack horses still have there place in modern times and used by guide outfitters and sight viewers. A land still boasts a wilderness feel, but the eco system is on the cross roads. Stikine country is vast wild area. Air transportation still has to fall back on the fixed wing and the helicopter. PWH has a base in Dease Lake is a connecting thread to all points in the north, servicing industry, emergency medievacs, and all kinds of work or site seeing as in the stikine canyon. Preferred by many as it leaves no scares on the pristine land. With the recent rise in demand for minerals exploration and mining companies have used tons of hours to haul in supplies into the outback for exploration drilling and scientific studies. Drilling and exploration camps work the North. The Stikine does not always flow in a calm and forgiving manor. A fifty mile section of river, mid point called the Grand canyon of the Stikine turns grade three water into six, suicidal for most craft. Here the water at Entry falls narrows and picks up the pace, churning floating trees to bits. Tearing fallen bolders into the river to pebbles. Walls in some areas are vertical where even mountain goats fear to tread. In other areas the river is narrow. One place at goats rock it is only two meters wide in low water. Holes and rapids that could easily devour a bus. The Stikine Grand Canyon not only is the home of the resident mountain goats but also several other species that thrive in the different climate. So impressive is the canyon that videos and movies have laid stake to this area. Several kayakers through the years have taken the challenge of navigating this chunk of water. An everest in kayaking. Due to the ruggedness of the canyons hiking is very difficult. The wise would suggest leaving it for the mountain goats. During the seventies BC Hydro engineers did feasibility studies on the dream to build two dams in the canyon. With public pressure the idea was dissolved after a few years. Now with a few scares the canyon is returned to its right full owners the resident goats. The tributary river of the Stikine, the Iskut river, also has a smaller canyon, with as much impact and splendor on the human mind, but is out of site of the general public and BC government allowed to be used it for Hydro development. To the south of the Stikine canyon lies the volcanics of the Mount Edziza area. For millions of years it has been on the cutting edge of volcanic upheavals and eruptions. Older eruptions to the south near spectrums range and more recent ones near Mount Edziza. Eve and Edzertza cones are more recent, some 1200 years young. This is a plateau with fresh lava runs and numerous volcanic cones. The nine thousand foot peak, the pipe organ is the highest point with ice packed for 200 feet thick eight miles long. The area is a flat plateau above timber line with rich nutrients from volcanic soils and ash. Here resides an eco system still in tack but different as it is adapted to the volcanic minerals nutrients and volcanic terrain. Here a small heard of caribou reside on the mountain. Cut off from the Stikine to the north, heavy mountains and snows to the south and west keep caribou local. To the east lies highway 37 which keeps caribou from straying to the east. Isolated, this small group of caribou that have recently been allowed to be hunted in Edziza park. A concern of majestic stock being sold off, and following a spiralling decline as in southern part of the province. Moose, Wolf, Grizzly bear, Mountain Goat, and Stone Sheep also reside here and make up the eco system. The glaciered top, broad plateau and the warm under ground make this area unique and sensitive area. It is an area that will not be able to stand the impact of human alterations.